Lawyers to leader of the proscribed Indigenous People of Biafra (IPOB), Nnamdi Kanu, have approached a Federal High Court in Abuja, for an order directing the Chief of Army Staff, Lt.-Gen. Tukur Buratai, to produce Kanu in court, after declaring him missing. The originating summons, which was brought pursuant to Section 40 of the Federal High Court Action, F12, LFN 2005, and Section 6(6) (1) (4) of the 1999 Constitution is seeking for an order of Habeas Corpus ad subjiciendum, commanding Buratai to produce Kanu in court. 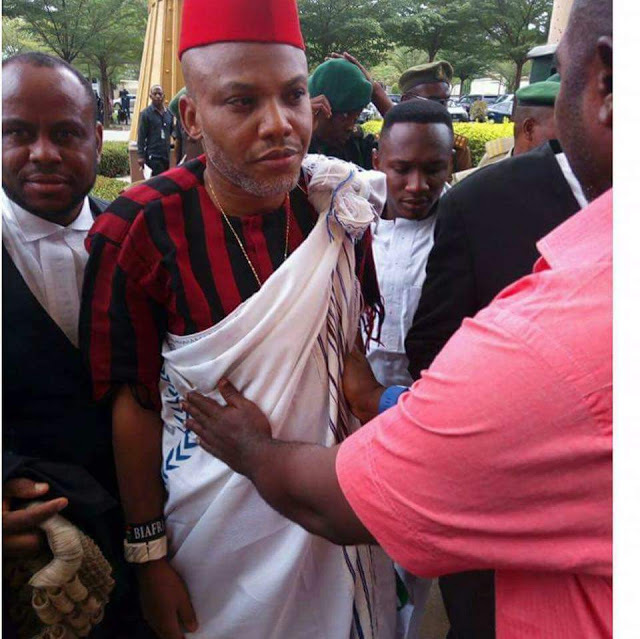 Kanu was arrested on October 14, 2015 and was consequently arraigned in court, along other defendants, on January 20, 2016, on an 11-count charge of treasonable felony, conspiracy to commit treasonable felony, belonging to an unlawful society, importation of goods, publication of libellous matters, among others. However, six, out of the 11-count charge had since March 28, 2017, been struck out by the court, including allegation of belonging to an unlawful society. He was subsequently granted bail on April 25, 2017, by Justice Binta Nyanko, of the Abuja Division of the Federal High Court. On August 25, 2017, the Federal Government, through the office of the Attorney General of the Federation (AGF), Abubakar Malami (SAN), filed an application requesting the court to revoke Kanu’s bail. Hearing on the matter is slated to commence on October 17, 2017. His lawyers, led by Ifeanyi Ejiafor told the court that Kanu was last seen after soldiers had, on September 14, 2017, invaded his house, located at Afara-ukwu Ibeku, Umuahia, Abia State. Others on the legal team include Maxwell Okpara; Chudi Igwe; Chinwe Umeche; Habila Turshak and Augustine Ezeokeke. The suit was predicated on the grounds that during “the bloody onslaught by the soldiers,” Nnamdi Kanu has not been heard from or seen after this bloody attack in his home by agents of the respondent since the September 14, 2017. Meanwhile, General Officer Commanding, 82 Division of the Nigerian Army, Major General Adamu Abubakar, has said Operation Python Dance II has drastically reduced crime in the South East, barely two weeks of its commencement. Abubakar said this yesterday, when he visited Oba Idemili South Local Government Area camp of the exercise. He was accompanied by Commander 302 Artillery Regiment, Col. Idongesit Akpan, Deputy Director, Army Public Relations, Col. Sagir Musa and other security chiefs in Anambra, drawn from the Navy, Police, National Drug Law Enforcement Agency (NDLEA), Department of State Services, Federal Road Safety Corps (FRSC) and Prisons and Civil Defence Corps (PCDC), where he restated that the exercise is not about any human being whatsoever, but to ensure a united country where everybody will be safe. He said the police gave the reports of crime in Anambra State and the Army looked at the analysis of crime in the last two months in the state and it became necessary, that the Army steps in to assist and since the exercise started, the level of crime has drastically gone down. “We should not be sentimental about things; we should look more at the national interest, rather than personal and parochial interest, when dealing with security issues. Lawyers to leader of the proscribed Indigenous People of Biafra (IPOB), ‎Nnamdi Kanu, have approached a Federal High Court in Abuja, for an order directing directing the Chief of Army Staff, Lt.-Gen. Tukur Buratai, to produce Kanu in court, after declaring him missing. However, six, out of the eleven count charge had since March 28, 2017, been struck out by the court, including allegation of belonging to an unlawful society. He was subsequently granted bail on April 25, 2017, by Justice Binta Nyanko, of the Abuja Division of the Federal High Court. Hearing on the matter is slated to commence on the 17th day of October, 2017. 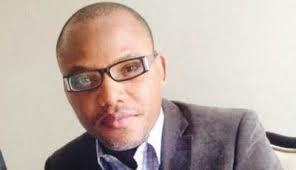 His lawyers, led by Ifeanyi Ejiafor told the court that Kanu was last seen after soldiers had, on September 14, 2017, invaded his house, located at Afara-ukwu Ibeku, Umuahia Abia State. The suit was predicated on the grounds that during “the bloody onslaught by the Soldiers,” Nnamdi Kanu has not been heard from or seen after this bloody attack in his home by the Agents of the Respondent since the 14th day of September 2017. Meanwhile, General Officer Commanding, 82 Division of the Nigerian Army, Major General Adamu Abubakar has said Operation Python Dance II has drastically reduced crime in the South East, barely two weeks of its commencement. Abubakar said this, yesterday, when he visited Oba Idemili South Local Government Area camp of the exercise. He was accompanied by Commander 302 Artillery Regiment, Col. Idongesit Akpan, Deputy Director, Army Public Relations, Col. Sagir Musa and other security chiefs in Anambra, drawn from the Navy, Police, National Drug Law Enforcement Agency, Department of State Services, the Federal Road Safety Corps and Prisons and Civil Defence Corps, where he restated again that the exercise is not about any human being whatsoever, but to ensure a very united country where everybody will be safe. He said that the police gave the reports of crime in the Anambra state and the Army looked at the analysis of crime in the last two months in the state and it became very necessary, that the Army steps in to assist, and since the exercise started, the level of crime has drastically gone down. “The Nigerian Army will always respect human rights, as it is enshrined in our Rule of Engagement, and also the code of conduct for which every soldier has a copy, human rights is there and we just have to respect it, as we are doing, we also urge the press to report exactly what you see.